If you are tired of the ridiculous prices, razor bumps, and irritated skin that comes with shaving with a disposable or cartridge razor it may be time to try an electric shaver. Check out our list below and follow our electric shaving tips to ensure you are getting the best shave and never have to buy overpriced blades again. 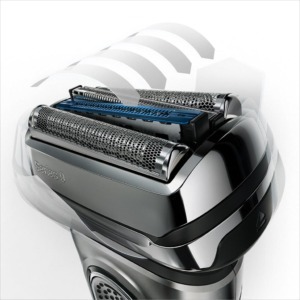 Our rankings are based the performance, features, and value that each shaver provides. We have added details for why each shaver is ranked where it falls and encourage you to read the full reviews available for many of these shavers on our website. Electric shavers are not a one size fits all appliance, to get the best results you should choose the shaver that best fits your shaving style. We do not hide the price of the shavers forcing you to click a link to see the “best price”, we display the best price we have found front and center. We have already written at length about the difference between the two shaver styles, but here is a quick recap to help you decide between the two styles. Braun and Panasonic both produce foil shavers while Philips specializes in rotary shaving technology. Foil shavers typically provide the closest and fastest shave. They are best for users who will be shaving every day who are looking for a shave closest to a shave with a manual razor. In general rotary shavers are better at shaving longer and thicker hair than their foil competitors. If you shave every couple days or have a coarse beard, you may benefit from using a rotary shaver. Typically they are slightly quieter and slower than foil shavers. An electric shaver is truly an investment that will benefit your wallet for years. Unlike manual razors which you may use for a month at most, electric shavers are designed to last five years or more with cleaning and maintenance. Braun, Panasonic, and Philips all offer 2-year warranties, and some shavers come with a money back guarantee allowing you to return the shaver if you are not happy with the electric shaving experience. Our top pick for foil shavers also claims the crown for the best electric shaver as well. The Series 7 is one of the top selling models of electric shavers for a number reasons. Strong performance, excellent reliability, and a drop in price combine to make this shaver the no-brainer choice for most people. Four models comprise the Braun 7 Series, but we have chosen the 790cc-4 as our top pick due to the extra features you get with only a small increase (~$10) in price. If you are looking to save a few dollars, also look at the Braun 7 Series 760cc-6 which may be available for slightly less $. The 790cc-4 adds a quick clean option, which allows you to perform a cleaning cycle in 20-30 seconds compared to 30-60 minutes on a normal cleaning cycle. This feature is useful if you forgot to clean the shaver after your last shave and don’t want to wait 30 minutes or more to get the best shave. Also included is a better LCD screen which displays battery and cleaning cycle information letting you know exactly how much battery life is available and if your shaver needs to be cleaned before its next use. The Series 7 shavers were the first to incorporate Intelligent Sonic Technology, which vibrates the shaver head at up to 10,000 vibrations per minute, capturing hairs of different lengths and density much better than other foil shavers. 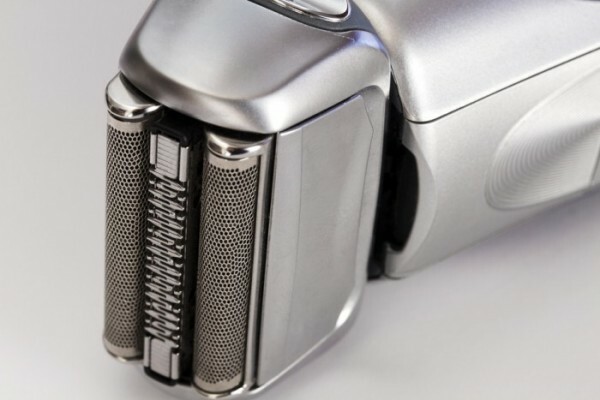 The shaver also includes the ability to shave at three varying speeds, providing a more comfortable shave on the neck and a faster shave on the face. The included clean and charge station, while not necessarily a must have feature, ensures your shaver is sanitized and completely charged before each shave. Exceptional performance, an attractive price, and excellent durability all combine to make the Braun Series 7 the best choice for most users. Our second place choice is Braun’s top of the line 9 Series. Just like the Series 7, all of the shavers in the Series 9 provide an excellent shave, possibly even slightly better than the Series 7. The only downside we found with the Series 9 was the high price it is currently sold for. Considering these shavers were just released in late 2015 we expect their price to drop over time. 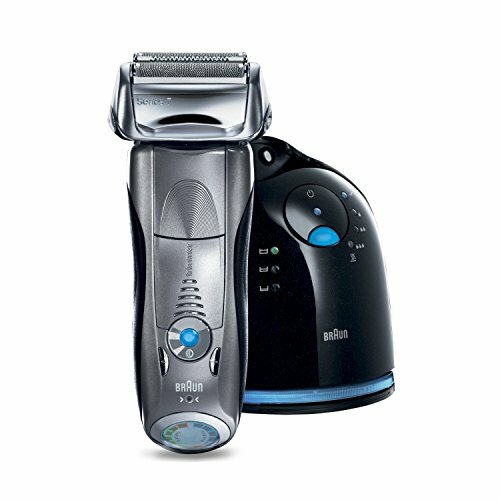 However, if you are looking for the best shave and the newest features available from Braun, the Series 9 is perfect for you. Just like the Series 7, the Braun Series 9 is made up of four models all sharing the same technology and very similar features. We believe the Braun Series 9 9090cc is the best choice for most users, the price difference between models are usually small ($5-$10), and spending the extra money to get all of the features for a shaver that can last over five years makes sense. If you are looking to use your shaver in the shower or with shaving cream you should consider the Braun Series 9 9095cc, which is designed for both wet and dry shaving. increase to speed, this upgrade allows the Series 9 to be more capable of cutting through longer hair, making it easier and less painful to shave that 5 o’clock shadow. If you tend to shave every few days instead of every day, you may find this shaver to be more useful for your routine. Also helping the 9 Series performance is the fully pivoting head and pivoting shaving elements. In addition to the shaver head moving around the contours of your face, the individual cutting elements can move independently as well. This extra movement is helpful when shaving around the chin and neck to reduce the number of passes required to remove all hair. Each shaving head moves in 8 directions to cut up to 20% more hair. The wet or dry electric shave system cuts hairs up to 30% closer. The blades shave closer and more comfortably. Choose the speed setting that best fits your skin and hair type: Slow (for an even more skin-friendly shave), Medium (for a thorough shave), and Fast (for a high-powered shave). The SmartClean System allows for easy maintenance: cleans, lubricates, dries, and charges your shaver. With AquaTec technology enjoy a comfortable dry shave or a refreshing wet shave. Our number 3 pick is our first rotary shaver, the Philips Norelco 9300. If you prefer to shave every few days instead of every day you may find this shaver to be an attractive choice over our first two, foil shaver, choices. The Norelco 9300 comes from Phillips top of the line Norelco 9000 series, our top pick for rotary shavers. We chose the Norelco 9300 over the Norelco 9700 due to the better value while maintaining the same shaving performance. If you are looking for the top of the line rotary shaver including an upgraded LCD display and cleaning station that shows the status of the cleaning cycle, take a look at the Philips Norelco 9700. Otherwise, if your focus is an excellent shave and an excellent value, the Philips Norelco 9300 will meet your expectations. The Philips Norelco 9000 series separates itself from the rest of the competition with its superior shaving ability, receiving high marks for the closeness of shave and overall shave quality. The 72 blades and range of motion of the three heads can contour to most facial features and do an excellent job at leaving few stray hairs. No other rotary shavers can meet the performance that the 9000 series provides. Panasonic has been competing with Braun for years, and their Arc4 is a solid performer that matches great performance with a very attractive price point. The Arc4 is below Panasonic’s Arc5 in their product line, but the performance between the two is so close that we recommend the Arc4 for most users. 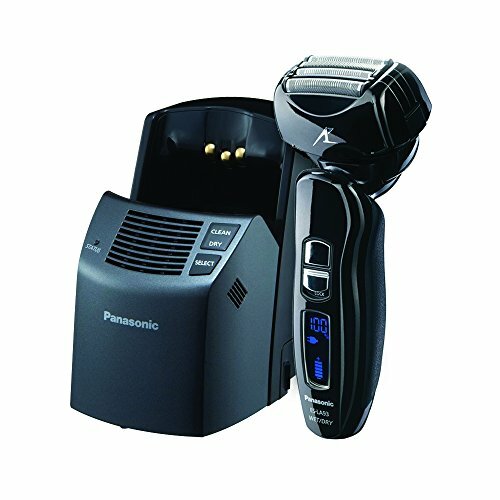 If you are looking for the fastest shave and all the features Panasonic has to offer, check out the Panasonic Arc5 ES-LV61-A instead. Compared to the Braun shavers, Panasonic clearly places more emphasis on the functional design of their shavers over the aesthetics. The Panasonic shavers, including the Arc4, use a much larger head giving a greater range of motion that some users may prefer. 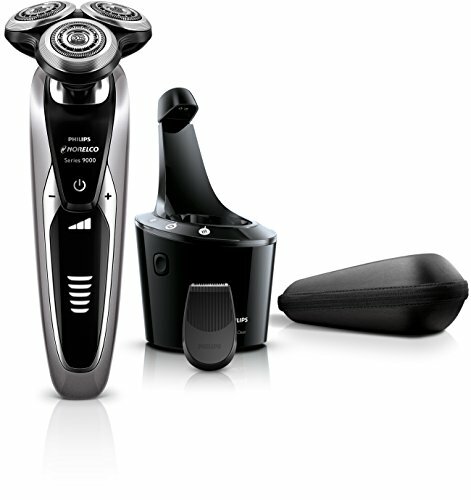 While the larger heads may provide a better shave, some users may find the larger size of the Panasonic shavers difficult to use when shaving the mustache and sideburns. The Arc4 uses four cutting blades to capture hairs of different lengths, which work well when stubble is kept to a minimum and shaving is done every day. We found that the Arc4 left some room for improvement when shaving stubble or growth of more than two days. As mentioned above, if you typically go a few days without shaving, consider a rotary shaver over a foil shaver for the most comfortable shave. New & improved Braun Series 5 succeeds where others fail. Maximum performance and skin comfort. Even in problem areas. 3X better adaptation. New FlexMotionTec delivers efficient shaving with less pressure, minimizing skin irritation. 20% more motor power. New PowerDrive ensures high-speed cutting, even on dense beards. Our final pick, the Braun Series 5, proved to be a challenging shaver to rank and review due to the similarities in features and price to the Series 7. Braun has not clearly defined why the price point for their lower end Series 5 falls so close to the Series 7, but perhaps that is by design. Performance wise we found the Series 7 provided a faster shave, but the Series 5 is not far behind and offers a some unique features that allow it to make our list of best shavers. 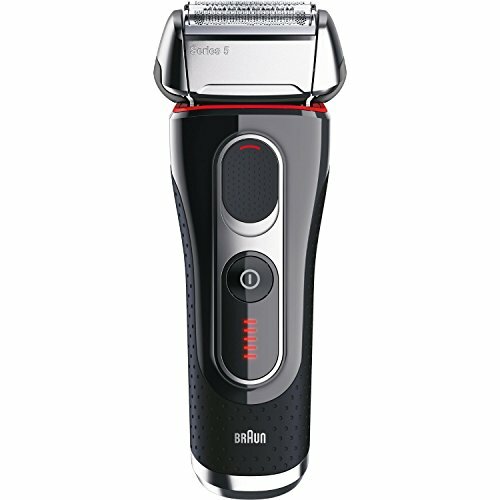 Like the Series 7, the Series 5 uses three cutting elements to provide a close shave, but does not include Braun’s sonic technology, offered on the Series 9 and Series 7. It may take slightly longer to shave and require a few more passes, but if you are patient, the shave outcome was comparable to what the Series 7 provides. Unique to the Series 5 is the ability to lock the position the shaver head is in, making it slightly easier to shave the neck area. The 5090cc also comes with a clean and charge station to the, only missing the drying feature that Series 9 and Series 7 clean and charge stands include. Consistently among one of the best-selling electric shavers, the Braun Series 3 is a great entry level shaver for those looking to spend less than $100. If you are looking to dip your toes into electric shaving, this basic shaver will be a good pick. This model does not include a clean and charge station, but it is fully washable which we recommend doing after each shave to ensure the best performance.